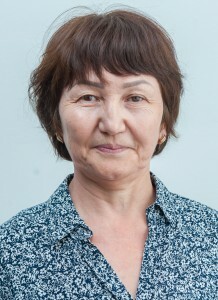 Tishmaganbetova Bakhyt Sadykovna was born on April 12, 1961 in the Karaganda region. In 1978, after finishing the high school, she entered the Almaty State Pedagogical Institute of Foreign Languages. In 1983 she graduated from ASPI with a degree in English and German Teachers. 1983-1986 the English teacher in the secondary school №1 in Zhanarka district, Karaganda region. 1986- 2003 – the English teacher in the secondary school №41 in Karaganda. 2003- the teacher of the Foreign Languages department ​​of KSTU.